Projet équestre Goldie is a not-for-profit organization that provides therapeutic riding services for children with physical and mental disabilities, and/or learning difficulties, at the best possible cost for parents. It’s a place of socialization and development where, every year, hundreds of children aged 3 to 18 increase their physical and mental health through contact with horses. Together, a team of therapists and volunteers develop personalized programs in the form of horseback riding—proven to be an effective aid in the advancement of children with disabilities. In short, this is a therapeutic alternative recognized by the health sector as well as various associations that work with the disabled. Projet équestre Goldie offers two approaches to therapeutic riding* that aim to improve the physical and mental health of riders. The rider, their instructor and a qualified professional such as a physiotherapist will collaborate to establish the desired therapeutic goals and design a custom equestrian program. *“Medical Component” in Manuel de l’instructeur canadien d’équitation thérapeutique, [s. l.], Canadian Therapeutic Riding Association, 1997, p. 3–5. The team is made up of five qualified therapists, twenty devoted volunteers and around ten well-trained horses, plus a very involved board of directors. 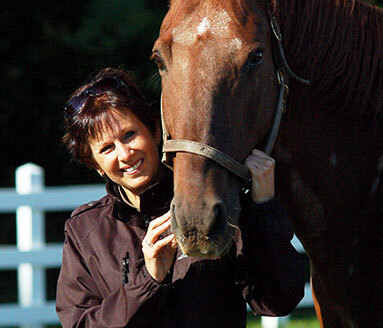 This adventure began back in 1999 when founder Carole Nantel discovered, quite by accident, how to combine her passion for horses with her love of working with children. While she was looking for a “second career” for her old mare Goldie, who could no longer accompany her on walks because of arthritis, she came into contact with a centre in Montérégie that provided therapeutic riding services for disabled children. After that, it was an easy decision to combine business with pleasure. She had finally found her path in life. She left her job and focused her mind, body and soul on her goal: Projet équestre Goldie.